Bring the kids along to Dolphin & Whale Watching and Nature & Wildlife Tours. Visit Roebuck Bay and Cable Beach for some beach relaxation. The adventure continues: head outdoors with Staircase To The Moon, explore the different monuments and memorials at Japanese Cemetery, identify plant and animal life at Malcolm Douglas Crocodile Park and Animal Refuge, and kick back and relax at Reddell Beach. To find photos, more things to do, maps, and more tourist information, refer to the Broome trip itinerary maker app . 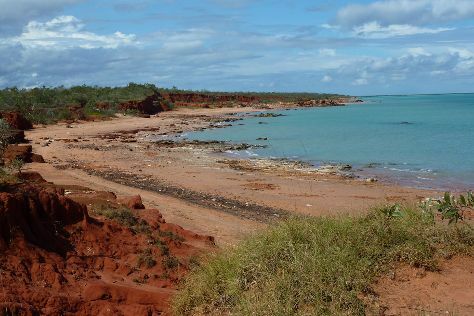 Bristol, UK to Broome is an approximately 25-hour combination of train and flight. You can also do a combination of train and flight; or fly. Due to the time zone difference, you'll lose 8 hours traveling from Bristol to Broome. September in Broome sees daily highs of 38°C and lows of 21°C at night. Wrap up your sightseeing on the 8th (Sun) early enough to travel to Kununurra. Get in touch with nature at Mirima National Park and Parry Lagoons Nature Reserve. Your cultural itinerary includes sights like Waringarri Aboriginal Arts and Artlandish Aboriginal Art Gallery. Explore Kununurra's surroundings by going to Wyndham (The Grotto & Marlgu Billabong). Spend the 13th (Fri) exploring nature at Mitchell River National Park. There's still lots to do: explore the stunning scenery at Emma Gorge, explore the striking landscape of El Questro Wilderness Park, snap pictures at Ivanhoe Crossing, and contemplate the waterfront views at Ord River. To find more things to do, other places to visit, photos, and more tourist information, read our Kununurra trip app . Traveling by flight from Broome to Kununurra takes 1.5 hours. Alternatively, you can drive; or take a bus. Traveling from Broome in September, you will find days in Kununurra are somewhat warmer (43°C), and nights are about the same (20°C). Finish your sightseeing early on the 14th (Sat) so you can travel to Esperance. Esperance is a town in the Goldfields-Esperance region of Western Australia, on the Southern Ocean coastline approximately 720km east-southeast of the state capital, Perth. Get a sense of the local culture at Esperance Museum and Cindy Poole Glass Gallery. You'll enjoy a bit of beach vacationing at Twilight Bay and Blue Haven Beach. Spend the 16th (Mon) exploring nature at Cape Le Grand National Park. Spend the 19th (Thu) exploring nature at Cape Arid National Park. 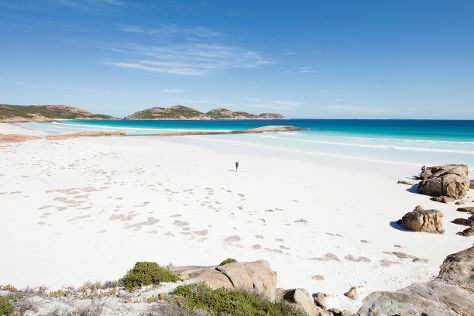 There's still lots to do: kick back and relax at Lucky Bay, stroll through Ten Mile Lagoon, take your sightseeing to a higher altitude at Frenchman's Peak, and cruise along Great Ocean Drive. To find other places to visit, traveler tips, photos, and tourist information, read Esperance trip planner . Traveling by flight from Kununurra to Esperance takes 9.5 hours. Alternatively, you can drive; or take a bus. While traveling from Kununurra, expect colder days and a bit cooler nights in Esperance, ranging from highs of 22°C to lows of 9°C. Wrap up your sightseeing on the 21st (Sat) to allow time to drive to Albany. Kids will appreciate attractions like Dolphin & Whale Watching and Middleton Beach. Get in touch with nature at Emu Point and Giant Tingle Tree. You'll find plenty of places to visit near Albany: Walpole (Mandalay Beach & Walpole-Nornalup National Park), Denmark (Moombaki Wines, Forest Hill Vineyard, & more) and Waychinicup National Park (in Cheynes). There's much more to do: tour the pleasant surroundings at Little Beach, admire the striking features of The Church of Saint John the Evangelist, take in the awesome beauty at Devils Slide, and pause for some photo ops at Desert Mounted Corps Memorial. To find more things to do, reviews, maps, and tourist information, use the Albany trip maker site . You can drive from Esperance to Albany in 5 hours. Alternatively, you can fly; or take a bus. In September in Albany, expect temperatures between 21°C during the day and 9°C at night. Wrap up your sightseeing on the 29th (Sun) to allow time to drive to Margaret River. We've included these beaches for you: Surfers Point and Meelup Beach. 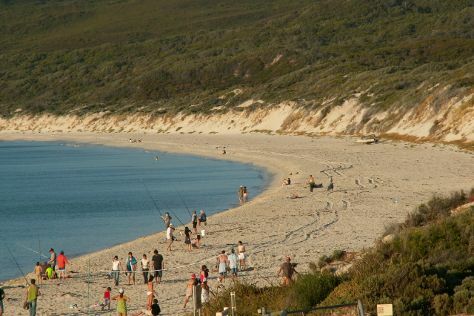 Step off the beaten path and head to Yallingup Beach and Hamelin Bay. Explore Margaret River's surroundings by going to Busselton (Dolphin & Whale Watching & Scuba & Snorkeling), Yallingup (Canal Rocks & Injidup Beach) and Sugarloaf Rock (in Cape Naturaliste). There's much more to do: look for all kinds of wild species at Sunflowers Animal Farm, learn about winemaking at Vasse Felix Winery, stroll through Cowaramup Bay, and kick back and relax at Margaret River Mouth Beach. Inspirock's itinerary builder makes planning a Margaret River trip simple and quick. You can drive from Albany to Margaret River in 4.5 hours. Other options are to take a bus; or do a combination of flight and bus. Wrap up your sightseeing on the 7th (Mon) to allow time to drive to Perth. Explore hidden gems such as Barna Mia Nocturnal Wildlife Experience and Rockingham Beach. 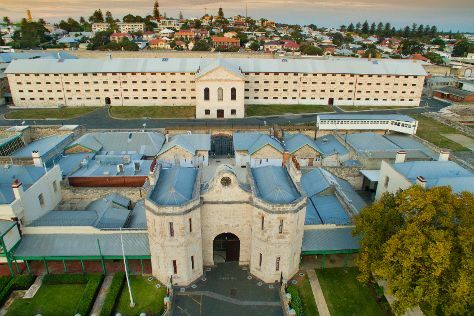 Get some cultural insight at Fremantle Prison and Scitech. Venture out of the city with trips to Point Peron (in Rockingham), Mullaloo Beach (in Mullaloo) and Fremantle (The Fremantle Round House & The Artisan Store Fremantle). Spend the 13th (Sun) exploring nature at John Forrest National Park. There's much more to do: kick back and relax at City Beach, admire the masterpieces at Art Gallery of Western Australia, learn about wildlife with up-close encounters at Perth Zoo, and take in the spiritual surroundings of St. George's Cathedral. To see other places to visit, more things to do, photos, and tourist information, go to the Perth online journey maker . Getting from Margaret River to Perth by car takes about 3 hours. Other options: take a bus; or do a combination of bus and train. In October in Perth, expect temperatures between 28°C during the day and 12°C at night. Finish up your sightseeing early on the 14th (Mon) so you can travel to Denham. Denham is the administrative town for the Shire of Shark Bay, Western Australia. Step off the beaten path and head to Francois Peron National Park and Ocean Park Aquarium. Bring the kids along to Shark Bay and Shell Beach. There's still lots to do: take in the dramatic natural features at Hamelin Pool Stromatolites and take some stellar pictures from Eagle Bluff. To find maps, reviews, traveler tips, and tourist information, read our Denham holiday builder tool . Traveling by flight from Perth to Denham takes 4 hours. Alternatively, you can drive; or do a combination of bus and shuttle. Finish your sightseeing early on the 17th (Thu) so you can drive to Kalbarri. Take a break from the city and head to Rainbow Jungle and Kalbarri National Park Coastal Cliffs. You'll visit kid-friendly attractions like Chinaman's Beach and Pot Alley Beach. There's still lots to do: take a memorable tour with Tours, explore the activities along Hutt Lagoon, identify plant and animal life at Kalbarri Pelican Feeding, and take in the dramatic natural features at Nature’s Window. For reviews, where to stay, maps, and more tourist information, read our Kalbarri trip maker website . Traveling by car from Denham to Kalbarri takes 5 hours. Alternatively, you can do a combination of shuttle and bus. Finish your sightseeing early on the 22nd (Tue) so you can drive to Exmouth. Exmouth is a town on the tip of the North West Cape in Western Australia. Kids will appreciate attractions like Shark Diving and Scuba & Snorkeling. Discover out-of-the-way places like Fishing Charters & Tours and Ningaloo Reef. Step out of Exmouth to go to Coral Bay and see Ningaloo Marine Park, which is approximately 52 minutes away. Spend the 27th (Sun) exploring nature at Mandu Mandu Gorge. Next up on the itinerary: take an exotic tour of a safari tour, take a memorable tour with Tours, view the masterpieces at The Ningaloo Gallery, and contemplate the waterfront views at Yardie Creek. Traveling by car from Kalbarri to Exmouth takes 8.5 hours. Alternatively, you can do a combination of bus and flight; or take a bus. October in Exmouth sees daily highs of 39°C and lows of 19°C at night. Cap off your sightseeing on the 29th (Tue) early enough to travel back home.